Britain's most elegant city and our best-known spa town. Located between the Mendips to the south and the Cotswolds to the north. Bath owes its origin to the legendary King Bladud, who founded a settlement here after being cured of leprously in its warm mud pools. The area was later occupied by the Romans who took advantage of the natural warm springs to develop an important bathing resort. 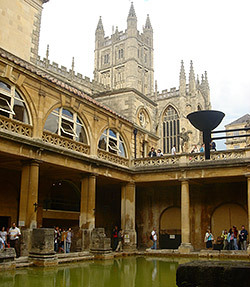 A small town grew up around the baths called Aquae Sulis (named after the god of hot springs). The settlement expanded during the medieval period when it became an important centre for the wool trade. Bath's fine abbey dates from this period. The town became a city in 1590 by royal charter. 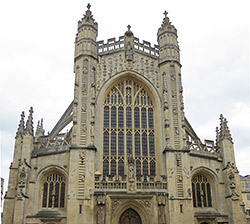 However, the true splendour of Bath did not begin until the 18th century when the city grew as an important health spa, frequented by all levels of English society, including Royalty. Today Bath is blessed with some of the best Georgian architecture in Britain. Much of which was designed by John Wood the Younger, who created its famous sweeping crescents. 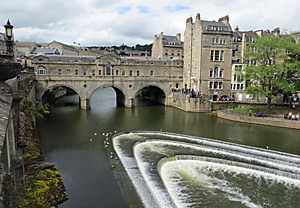 Other influential architects include Thomas Baldwin, who built the Guildhall (1766-75) and Pump Room (1789-99) and Robert Adam, whose Pulteney Bridge still provides a charming carriageway over the Avon, lined with shops on either side. The bridge was modeled on the Ponte Vecchio bridge in Florence, Italy. 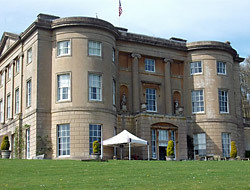 The Georgian architecture is best exemplified by Bath's Royal Crescent, a curved row of 30 houses overlooking an expanse of lawn. House No 1 is open to the public and No 15 was the fictional home of Sir Percy Blakeney (the Scarlet Pimpernel). Nearby is The Circus where the houses are set in a circle. Dr Livingstone lived at No 13 and the painter Gainsborough at No 17. It is said that he painted the 'Blue Boy' here. Bath is a compact city and usually heaving with tourists during the summer months, so its busy streets are best seen on foot. There is certainly plenty to do and see here. Extensive Roman remains can be found in the city, the most impressive of which are the baths themselves. The Roman Baths were rediscovered in 1879 and are now the city's largest attraction. The Pump Room, next door, is where the Georgian dandies once congregated, and visitors are still able to 'take the waters' that flow continuously from a fountain outside. Other places of interest that should not be missed are the Museum of Costume, a marvelous collection of fashions spanning the decades and Sally Lunn's House, where you can enjoy a traditional Bath Bun. If you are on a tight budget then a visit to the Holburne Museum and Victoria Art Gallery are both free. 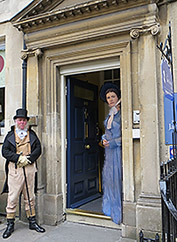 For those seeking a guided tour of the city you can catch one of the many open-top bus tours or experience the "Jane Austen walking tours of Bath", where knowledgeable guides will take you on a tour of the places in Bath made famous in Jane Austen's novels. For tour details contact the Visitor Information Centre in Abbey Churchyard. Discerning shoppers have been flocking to bath since Georgian times and the city centre boasts an excellent range of independent and branded stores, from chic jewellers to stylish boutiques. 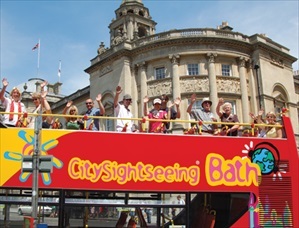 The CitySightseeing Bath hop-on-hop-off tour takes the hassle out of finding your way around, leaving you free to enjoy the sights and make the most of your time. With stops all over the city, you can hop off and on as many times as you like within 24 hours. The tour route takes you to many of Bath’s fabulous attractions. Opening Times: Daily, all year round (except 25th/26th December and 1st January) . Departure Location: You can hop on or off at any stop along either Citysightseeing route. A unique museum of American history and decorative arts. It's many period rooms display a diverse collection of native American artifacts, sculptures and fine artwork from the 17-19th centuries. The museum is set in 30 acres of landscaped grounds with enchanting gardens, sweeping lawns, shrubs and mature trees. Special events, exhibitions and activities are held throughout the season. Attractively set in a wide plaza beside the Pump Room, the abbey was founded in 1499. The twin towers that adorn the Abbey's west front, are famed for their carved stone angels that climb to heaven on ladders. This fine 15th-c church was built over site of a much older Saxon abbey where prince Edgar was crowned King of England in 973. The interior is blessed with magnificent fan-vaulting and classic Norman arches, below which lie numerous memorials from many periods. Open to the public. Includes Heritage Vaults Museum. Learn about the history of glass making in Bath. Visit one of the regular glass blowing demonstrations, or why not blow your own during one of the regular glass making courses run on Saturday mornings. Celebrates the history of the Penny Postal service, which began in Bath during the 18th-c. Includes exhibits on the history of written communication from ancient cuneiform text to the present day. Plenty of hands-on and interactive exhibits. Located in the magnificent Assembly Rooms, is the world's largest costume exhibition, which dates back to the 17th-c. All aspects of fashion are covered, from the latest styles to fashionable Victorian, Regency and Edwardian costumes. Includes a dressing up area for children. Adults can also try on a 19th-c corset or a crinoline. Fine 18th-c town house containing lavish Georgian furnishings. The museum within is dedicated to the accomplished astronomer and musician William Herschel, who discovered Uranus in 1781. Highlights include Herschel's workshop and music room and the 'Star Vault' astronomy auditorium. Built in the Palladian style (circa 1796) as part of Sydney Gardens. It was converted to a museum in 1913, housing a unique collection of period furniture, silver, porcelain, miniatures, rare glass and silhouettes. Also paintings by Gainsborough, Reynolds and Stubbs. This period Georgian town house, located in the centre of Bath, contains a small museum dedicated to the popular 18/19th-c author Jane Austen. She lived in Bath from 1801 to 1806 and her in-depth knowledge of the city is reflected in two of her most popular novels, 'Northanger Abbey' and 'Persuasion'. Once you have enjoyed the tour and perused the many period exhibits, a traditional high-tea can be sampled in the elegant Regency style tea rooms, located on the second floor. Built in 1768 by John Wood. This classic Georgian property has been fully restored to appear as it would when originally constructed, including authentic period furnishings, furniture and paintings. An early 18th-c Georgian mansion, beautifully situated on a hill overlooking the city. The house is set in magnificent landscaped grounds with lakes and a Palladian-style bridge. The great bath buildings and temple were once the centre of Roman Bath. Over 240,000 gallons of water still flow daily from the springs below at a constant temperature of 46°C. The on-site museum displays finds found on the site and explains how the baths were developed and used, with interactive exhibits and audio visuals. The famous waters can still be sampled in the Pump Room next door and local swimmers can still bath in the waters, which are piped to the city's pubic swimming pools. Bath's oldest house, made famous by Sally Lunn's baking skills. The original Georgian oven and cooking equipment is on display in the museum. 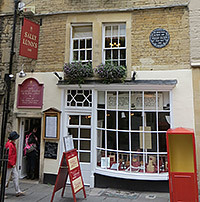 The famous Sally Lunn Bath Bun (made to the original Georgian recipe) is served in the restaurant. Changing temporary exhibits, plus local exhibitions, drawn from the gallery's collection of British works from the 17th-20th centuries, including paintings, etchings, prints, drawings, water-colours and sculpture. Also on display are English ceramics and glass, British Delftware, Bohemian glass, miniatures, watches, Bath Mint coins and trade tokens.